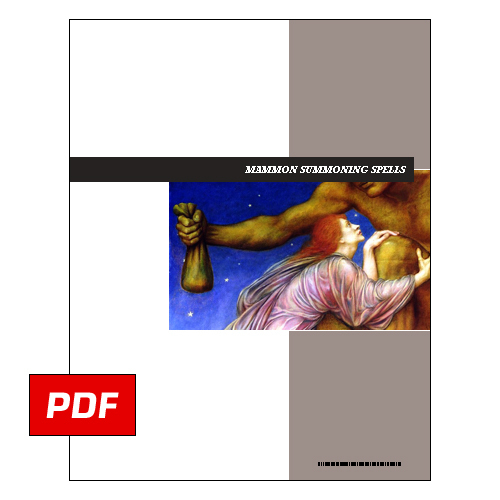 Product Description: Mammon is a powerful demon and one of the greatest tempters of mankind. It is said he once had a great lust for Satan's power, and as punishment for this betrayal, Mammon was forced to worship a giant gold and gem-encrusted boulder for all eternity. The only relief Mammon can gain from his eternal torment is by tricking mankind into trading their souls for gold and material wealth. Summoners that have made contact with Mammon often state that he manifests himself as a large black wolf with glowing red eyes. It is easy to gain favor with him if you are extremely ambitious in your pursuit of wealth. There are many individuals that claim to have become rich by gaining the favor and fellowship of Mammon.